There are two main reasons why most people choose to shop for a safe for their valuables. One is to protect them from theft, and the other is to protect them from fire. Considering that there are over 350,000 fires every single year with property damage collectively exceeding $6 billion, purchasing a fireproof safe is a sensible thing to do. With a fireproof safe, you can ensure that your beloved possessions, key documents, and even your electronic data are safe until help arrives. Not all fireproof safes are equal however, so it is smart to do some research before you shop. In fact, we have done some of the legwork for you, compiling a comparison table of the best fireproof safes on the market today. How do you choose the right fireproof safe? Start out by asking the right questions to evaluate your needs, and then choose a safe with the features which best fit those needs. 1. What types of valuables will you be storing in your safe? This is something you need to consider when you are looking into fireproof ratings for safes. Some safes only include ratings for paper documents, but others include ratings for digital media. If you are going to be storing memory cards, DVDs, USB drives, smartphones and so on in your safe, you need to buy one which can protect data. 2. What dimensions and internal organization features do you need? It is always important to think about size when you are shopping for a fireproof safe. Consider where in your home you will place the safe as well as the contents you need to store. Pick a safe which will fit those contents as well as the space you have selected. Some safes include shelves and drawers for internal organization as well. In some cases, those shelves may even be removable so you can configure the space as needed. 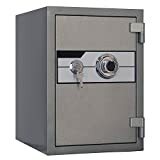 Your main reason for buying a fireproof safe may be to keep your valuables from burning, but it is important to remember that a safe is still a safe, and it fulfills other important purposes as well, like keeping burglars away from your possessions. To that end, you should look for the same security features you would on any safe, including large bolts, a pry-resistant hinge bar, sturdy bolts for anchoring, and so forth. 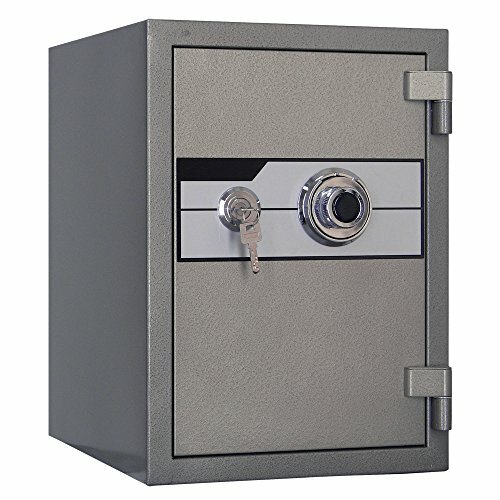 A safe which has been UL tested and rated to withstand tampering and tool attacks is best. The best fireproof safes are made out of heavy-duty steel. This too is a security feature, since sturdy materials help keep burglars out. They also provide protection against impacts. That is relevant to the matter of house fires, because in a blaze, it is possible for walls, supports and floors to collapse. If the safe is located on an upper floor, it could fall quite a distance. Even if it is located on the ground floor, it is still in danger, since something could fall on top of it. If the safe is made out of strong materials, it will survive intact. 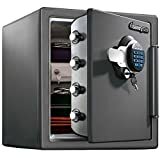 You will find fireproof safes for sale with digital keypad locks, mechanical combination locks, biometric scanning systems, and other types of locking mechanisms. Each has its advantages and its drawbacks. Decide for yourself what type of lock will be most suitable for your needs. When you are shopping for a fireproof safe, the fireproof rating itself is one of the most important considerations. It is also one of the more complicated ones. Fireproof ratings are provided by Underwriters Laboratories (“UL”). You should actually think of them more as “fire resistance” ratings since nothing can be fully fireproofed indefinitely. The number you see is a temperature. So you can read them as “UL 125 degrees Fahrenheit,” “UL 150 degrees Fahrenheit,” and so on. This lower the number, the higher the fireproofing rating. The number does not refer to the temperature of the blaze surrounding the safe; it refers to the temperature inside the safe. The timeframe refers to how long the safe can maintain the listed internal temperature. So in the first case, “UL 350 1 hour,” the safe can maintain an internal temperature of 350 degrees Fahrenheit for a period up to 1 hour. After that, the temperature will rise. UL 125: Protects papers, photographic film, magnetic tapes, and computer disks. UL 150: Protects papers, photographic film and magnetic tapes. UL 350: Protects only papers. So a UL 350 safe would not be suitable for storing data, but a UL 125 safe would be. 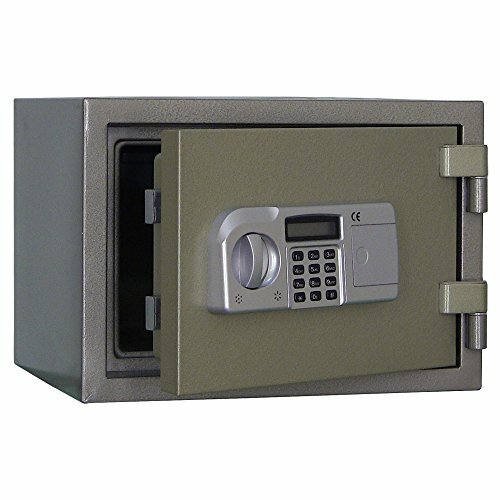 You can even find UL 72 safes, which are even better. Ideally, you should buy a safe which is “UL listed” as opposed to simply “UL tested.” “Tested” is a vague word. It does not tell you whether a safe actually passed. Finally, what do you need to know about timeframes? Data on the average fire indicates that it burns at a temperature of 800 degrees Fahrenheit. It is put out within 20 minutes. Underwriter’s Laboratories runs its tests at temperatures of 1850 degrees Fahrenheit. So you are all set on that count. As to the timing, 1 hour should be more than sufficient for most people. If your fire burns that long, it has gone on for three times as long as the average fire. If you are in an especially remote area or you have a very large home, you might consider going with a longer timeframe. Finally, let’s talk about water resistance. It is easy to overlook the importance of waterproofing when you are worried about fire, but water damage can be just as big a threat to your valuables as flame. Indeed, a fire in one room could lead to a pipe springing in another. Look for the ETL verified waterproof guarantee while you are shopping for your safe. In order to earn this guarantee, a safe must survive an hour of complete submersion with no more than 8 drops of water penetrating within. If you see a safe for sale which is promoted as water-resistant rather than “waterproof,” that means something else. During testing, the safe was not submerged completely, but it did provide effective protection to its contents in 6 inches of standing water. Moreover, it was able to withstand being blasted with water spray for 15 minutes without damage. This is also a solid rating, but it is not as impressive as the waterproof guarantee. When it comes to providing powerful protection for your valued possessions, the roomy Steelwater AMSWD-500 offers top-notch defense against burglars as well as fire. Measuring 19 1/4” x 13 3/4” x 16 3/4” on the outside and 15” x 9 3/8” x 12 1/8” on the inside, it weighs 115 pounds and contains 0.99 cubic feet of space. The safe provides 2 hours of fire protection. Your possessions should remain safe and undamaged in a blaze burning as hot as 1850 degrees Fahrenheit for up to two hours. You can anchor this safe if you wish. A pre-drilled anchor hole makes it a breeze to bolt your safe down to the floor if you wish. Strong construction keeps your valuables safe. This safe includes two layers of steel for extra protection. The door swings open wide. You can open this door at a 180-degree angle, which means that it is totally out of your way when you need it to be. Includes a removable tray and shelf. This allows you to configure the interior space any way you need to in order to store your valuables. Backup keys are provided. If you do forget the combinations (see below), you can let yourself into your safe using one of the two backup keys which come with it. The pre-set combinations cannot be changed. If you have a hard time remembering combinations you did not select, this could be an inconvenience. Looking for a highly rated fire safe which includes top-notch construction and a UL rated lock? 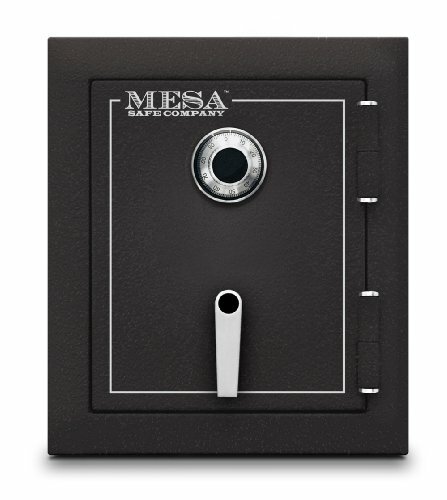 The Mesa Safe MBF1512C is brimming with great features and has proven its strength and performance through extensive testing. The MBF1512C protects your possessions from fire for up to two hours. 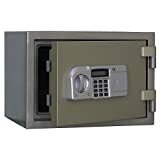 The safe has been tested in temperatures as hot as 1830 degrees Fahrenheit and has received a 2-hour 350-degrees Fahrenheit rating. The heat activated seal provides the safe contents with the extra protection they need in a blaze. The lock is UL listed. With a UL listed Group 2 combination lock, you don’t need to worry about intruders getting through. This safe has a two-story impact rating. In other words, if an intruder throws it out a window and it falls two stories to the ground, it should survive the impact intact. This rating was earned through factory testing. There is a removable shelf. The removable shelf is adjustable and built to be extra strong. You can configure it as needed to fit the dimensions of your items, and can safely store heavy items on top of it. If you wish to anchor the safe, doing so is easy thanks to the included kit. The safe comes with four pre-drilled anchor holes as well as a full anchor kit. Bolt it down with the kit, and hopefully you’ll never have to test its impact rating. The lock can be a pain. Have a difficult time getting combination locks to open? You may find this one particularly tedious. It requires that you be painstakingly exact. 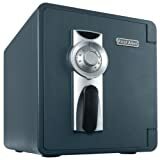 It can be a challenge to find a safe which is relatively small, but also stupendously heavy. One which fits the bill is the Steelwater AMSWEL-360. The exterior dimensions are 13 3/4” x 19 1/4” x 16 ¾ while the interior provides 9 1/4” x 15” x 12 1/8″ of space. Weighing in at 115 pounds, this safe is a solid addition to any home security setup. Your possessions will be protected from fire for two hours in this safe. The rating is for up to 1850 degrees Fahrenheit. Construction includes a double layer of steel. A lot of competing safes feature a steel outer layer but plastic for the door and inner walls. Solid steel is used for all of these components in the AMSWEL-360. You can configure the interior space. There is a tray inside the safe which you may use to arrange your valuables. If needed, you can remove it entirely. The reprogrammable system lets you choose your own codes. You can set a handful of different codes as per your needs. The instructions make it clear how to do this with ease. What if the battery dies? Your codes will still be stored in the SSD memory, so once you have a new battery in place, you can get your safe open right away without having to reset your codes. There is no setting to silence the beeps. Some users may find this irritating, while others may wish to run a silent mode for reasons relating to safety and security.